As you can see, this is not a classic cheesecake that we are used to eating here in America. 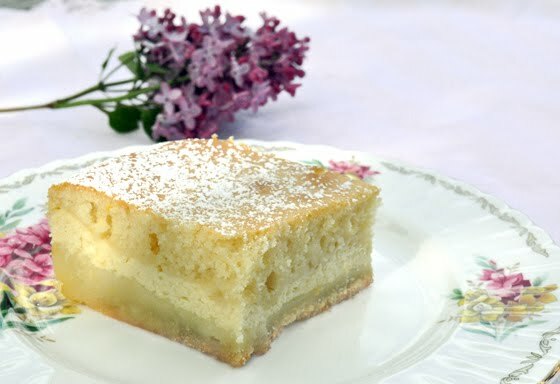 It is Croatian Cheese cake, or pita, how we call it. Often we make it with additional layer of grated apples with cinnamon or with raisins or with both. They are very tasty in any version, but this time I wanted a light, fast and simple cheese cake. Also, another big difference is that it is made with cottage cheese, not cream cheese. You can blend it for a bit of a smoother filling or leave it as is. It is not a big difference and it certainly tastes the same. First mix the sugar and the eggs, then add all the other ingredients and mix until combined. Pour half of your dough into a greased pan and bake for 10 minutes. Take out of the oven and pour cheese filing on top and bake for 15 minutes, then take it out and pour the rest of the dough on top. Bake for 25 more minutes. Drain the cheese well before blending it with egg and sugar. If desired you could ad another 1/2 tsp of rum extract to the filling. Let the cake cool completely and then sprinkle with powdered sugar before cutting. to improve my site!I guess its adequate to use some of your ideas!